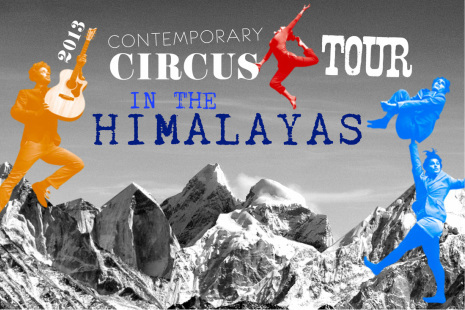 During november 2013 Kollektiv Knaster went to Nepal with the street version of our show Kollision. In a cooperation with the Swedish-Nepalese NGO Tuki Nepal, and their sister organizations, we visited refugee camps, orphanages, schools and isolated villages in the Himalayas. Through the project we wanted to bring laughter, creative inspiration and a unique cultural experience to the places we were visiting. Kollision is a physical, magical, playful and non-verbal show, dealing with questions about hierarchies and norms. It allows the audience to question and laugh about serious subjects that we all meet in life irrespective of age or culture. After each show we held circus workshops for the children and youths. We gave the participants the opportunity to try and experience new things they didn't know they were able to do. It increased their confidence and knowledge about their own body and gave them new creative tools to express themselves and a ground for them to continue to develop and train on their own even after we left. Nepal is one of the poorest countries in the world and besides Nepalis the country also holds many refugees from Bhutan and Tibet. During our time in Kathmandu we visited different orphanages for street children, children with their parents in prison and a Tibetan camp, school and orphanage. During our time in the city we also did two public shows on the street. There we had an mixed audience of street kids, dogs, tourists, businessmen, military and families passing by and got trapped by the magic. To also reach some children outside of the city we were on a 10 day long trek to the region Lower Ganesh in the mountains. During our way we visited small rural villages, many of them so isolated that the only way to reach them is by many days by foot. Everywhere we have been, we got received warmly. We were greeted with a lot of laughter, curiosity and wonderful meetings. After this trip we are more sure then ever that culture activities are a outstanding tool to inspire, interact and establish meetings over cultural and national borders. A big thanks to Kulturrådet, Karavan, Studiefrämjandet, Tuki Nepal, Tukee Nepal Samaj and Jonas Liljegren for suport and cooperation! See our video from the project under the page VIDEO in the top bar.